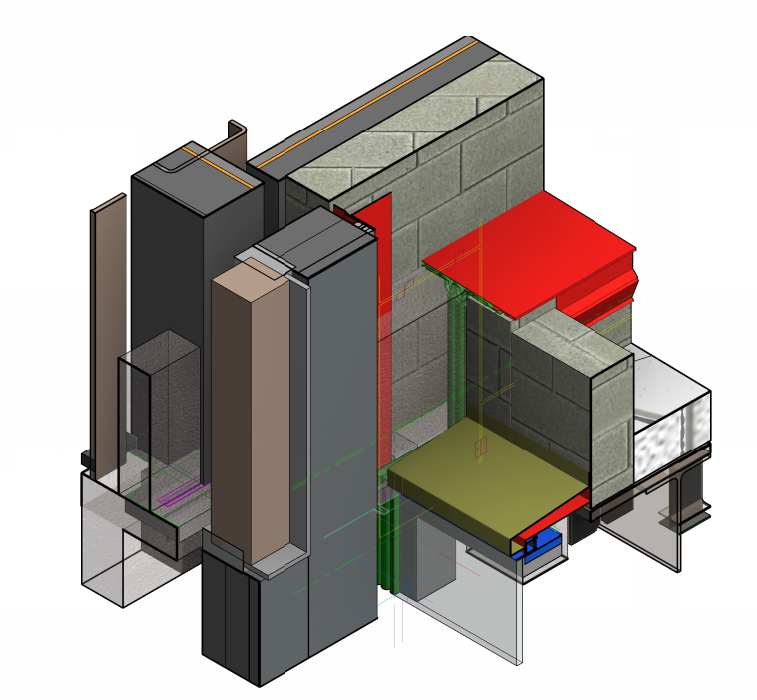 Building Information Modeling | BIM Coordination for Building Envelope - Zero/Six Consulting, LLC. Identify issues virtually before they become a reality. The majority of building envelope performance issues relate to the lack of communication between the various trades. Computer-Aided Design & Drafting (CADD) offers an excellent venue for communicating clearly to all trades the proper installation, sequencing, and an understanding of one other’s role on the project. We can also supply models and testing information such that it can be incorporated into BIM documentation for our clients. Building Information Modeling (BIM) is an intelligent 3D model-based process that equips architecture, engineering, and construction professionals with the insight and tools to more efficiently plan, design, construct, and manage buildings and infrastructures. The model-based design process adds value across the entire life cycle of the building envelope, creating designs with intelligent objects. Similar to the space program, we’re not just bringing rocks back from the moon. We’re investing in the future by using BIM to provide long-term benefits over the life of your building that far outweighs the upfront cost of the service. The project is constructed virtually prior to actual construction. The Model takes into account envelope shop drawings, RFI’s, addendums, and change orders. The BIM model is updated with the RFI process & the construction process. Structural elements and the building envelope are coordinated together and adjusted if necessary. Provide Resolution to issues that are discovered. RFI’s are coordinated into the model creating a coordinated document that can be used for construction rather than building off of many RFIs. Shop drawings are reviewed to ensure they meet design intent and don’t clash with other trades. Contract documents are also reviewed for any clashes or conflicts. The project can be constructed from the model. Conflicts are identified before they become an RFI. As building envelope specialists Zero/Six provides details based on field tested methods. Lower net costs and risks are recognized by owners, designers, subcontractors and engineers. The model can be used for project As-Builts. The model can be used by the owner for facilities purposes. Safer, more effective structures for the owners and occupants. Efficient monitoring lowers operating costs. Fewer construction mistakes. It is far less expensive to fix issues on paper than it is in the field. Enables AEC professionals and owners to design, visualize, simulate, and analyze the key physical and functional characteristics of a project digitally— before they build it. A complete view of the project results in team members making better, more-informed decisions across the entire building life cycle.